This new canal was a crucial link between canals in the north and south. The canal undoubtedly contributed to the industrial growth of the UK. In the 18th century, come up with a better way of transporting goods than bumpy roads. Build 90 miles of canal to move goods and people by barge instead. Build a canal to transport goods for miles and help deliver Wedgwood pottery in one piece. The Trent and Mersey canal is 93.5 miles (150.5km) long and runs through the east Midlands, west Midlands and the north west of England. 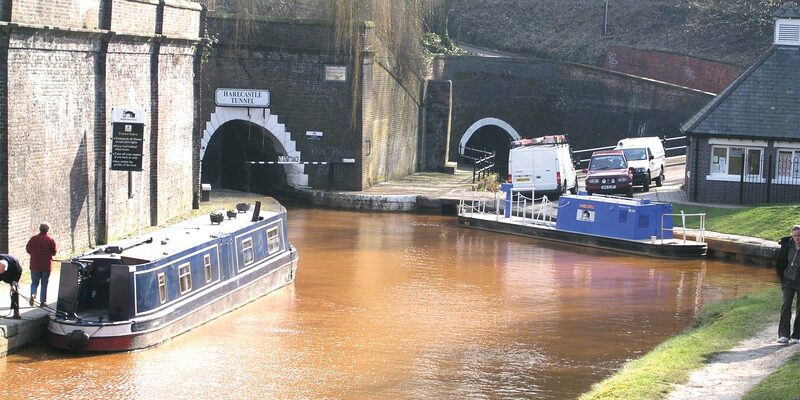 The waterway was designed in 1766 by James Brindley who mapped out a route with more than 70 locks and 5 tunnels. The engineer saw the canal as being part of a network linking the 4 ‘great rivers’ of England – the Mersey, Trent, Severn and Thames. The canal was championed by Stoke-on-Trent potter and entrepreneur Josiah Wedgwood. Wedgwood’s high end pottery was fragile and could easily be damaged when it was moved on the often rough and uneven roads of the day. Wedgwood believed that his goods were more likely to be delivered in one piece if they were transported by water. Opening in 1777, the canal was the biggest ever civil engineering project England had seen at the time. A major route for trade in its day, the canal is seen as playing a key part in the industrial revolution. As well as pottery, the canal was used to carry iron, coal, timber and other raw materials for industries around the country. Brindley did not live to see his canal finished as he died in 1772. Javid Iqbal from the ICE Staffordshire branch talks to us about the Trent and Mersey Canal and its main instigators, including Josiah Wedgewood who was unable to expand his pottery business until the canal was built. The Trent and Mersey canal made it possible for businesses to move raw materials and other goods around the UK in large volumes. This made it easier to mass produce consumer goods. The waterway contributed to industrial growth across the country. It became a crucial link between canal systems in the north and south. The Trent and Mersey set early standards for canal design in the UK. Brindley made the waterway relatively narrow – the locks were 7ft 6ins (2.29m) wide. The narrow width may have been dictated by the fact he could only build the Harecastle tunnel – part of the canal route – to take 7ft (2.1m) wide boats. Brindley’s method for waterproofing a canal after it had been dug saw workers lining the channel with ‘puddle’ – a special type of clay. The technique is considered Brindley’s greatest contribution to engineering. To make puddle, workers mixed clay with water and sand. Puddle was usually laid about 10ins (25cm) thick at the sides of a canal and about 3ft (c.1m) thick at the bottom. Workers trod down the puddle or compacted it using hand tools. Another method of compacting involved driving cattle across the area. James Brindley… knew water, its weight and strength. in the Chester Courant, 1 December 1772. The UK’s first boat lift was built on the Cheshire stretch of the Trent and Mersey in 1875. The ‘Anderton lift’ lowers boats from the canal onto the river Weaver. It was the only boat lift in the UK until the 2002 constructionof the Falkirk Wheel in Scotland. At 1.5 miles (2.4km) long, the canal’s Harecastle tunnel was one of the longest in the UK when it opened. The Harecastle is actually 2 parallel tunnels. The first, known as the Brindley tunnel, was part of the original canal. It closed in the 1900s because of subsidence. The second tunnel was built by engineer Thomas Telford in 1827. Unlike the first, it has a towpath. It’s still in use.